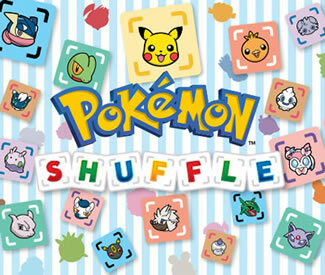 Pokémon Shuffle is a free to download puzzle game for the Nintendo 3DS and Mobile devices and forms part of the Generation VI & VII side series. The game was released for the Nintendo 3DS on February 18th, 2015 and later on in the year for mobile devices on September 1st. There is a maximum number of moves you have to complete each level in - the number of moves remaining shows at the bottom left corner, defeating the Pokémon within the allocated number of moves for that level gives you a chance to catch it and add it to your team. If the player completes all of the main levels they can unlock Expert Stages, where only the boldest of shufflers dare tread; these stages do not have a maximum number of moves but instead have a time limit you have to complete each level in. The player begins with five hearts (almost used like play credits) and every time a level is attempted it costs a heart, whether or not the level is succesfully completed. Hearts do regenerate but only at a rate of one every half an hour and a maximum of five hearts can get regenerated. Using StreetPass is another way of recieving hearts, the game will always use up hearts that were regenerated before ones obtained via StreetPass. Pokémon Shuffle is a freemium app so real money can be used to purchase hearts, Jewels or power ups to bypass the hearts system. The introduction to the Main Stage route and first wild Pokémon encounter in Shuffle. The mobile version requires an internet connection to play, the 3DS version doesn't. In the mobile version you can turn on push notifications in the App which will notify you when hearts are regenerated. Where 3DS users can use StreetPass to obtain extra hearts and unlock more playtime, mobile users can use Facebook integration to obtain mini hearts. None Facebook users can send each other friend codes to obtain mini hearts. 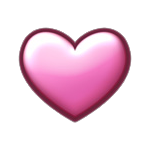 Each mini heart recieved fills up a bar called the friend gauge and when the bar is fully filled up a heart is awarded. Passcodes from the 3DS version do not work with the mobile version. When you complete your first battle against a trainer with a mega evolved Pokémon in the mobile version you get five hearts as a reward instead of the Jewel you'd get in the 3DS version. Where competitive rankings and prize tiers would be broken down into regions on the 3DS version, they are done globally in the mobile version. There is a monthly spending cap on the mobile version of the game of around 1000 GBP or 1500 USD. 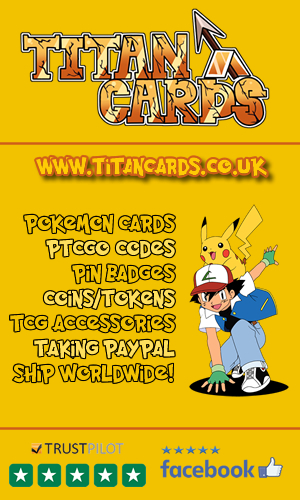 If they've had to impose that sort of thing I dread to think how much some rich Pokemaniacs must have been spending. Hitting an enemy mon with a status affect will not trigger the wild Pokémon's disruption timer to countdown on the Mobile version, but as of update v.1.3.28 it will still trigger the countdown on the 3DS version. Pokémon Shuffle contains an impressive 600+ stages which are broken down into four categories; 580 Main Stages, 48 Expert Stages, A number of limited availability Special Stages and 50 Survival Mode stages. The Main Stages follow a linear order and the current stage must be beaten in order to unlock and move onto the next one; these stages are move limited. stages follow a path through various areas with their own themes and music. The more S Ranks you obtain as you progress through the main stages the more Expert Stages you will unlock, where you'll face off against much tougher mons that work on a time limit instead of number of moves. Defeating the same mon with S Ranks multiple times doesn't count toward unlocking these. Preparing support Pokémon on a 3-Pokémon Stage, Choosing items to help in battle, taking on Mareep in a Main Stage battle, limited by number of moves. Expert Stages - Like Main Stages but usually more difficult, and time limited instead of move limited. Like Main Stages, Expert stages require hearts to play. The Special Stages are changed each week that you check in online and download the new data to your app; these stages can be either move limited or time limited. 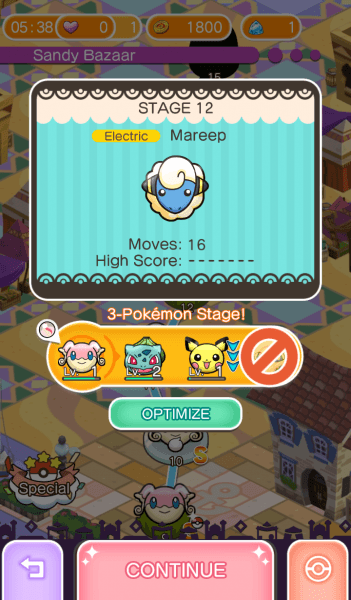 In order to access special stages you must first complete the tutorial, which essentially just means playing through the first 11 levels of Pokémon Shuffle and listening to Amelia's tips. Sometimes Special stages can require a set number of coins to play rather than hearts. Survival mode, this is one hell of a challenge for even the greatest of Shufflers. Complete 150 Main Stages to unlock this mode. The player will be subjected to 50 consecutive stages and once they've chosen their initial supporter Pokémon for the first one, they don't get to change them. The stages are a randomised selection of the first 150 Main Stages. Luckily you don't have to complete the whole thing in order to get some rewards and when you complete achieve certain milestones, you'll be rewarded - even if you don't finish the 50. Upon completing a Stage you usually have the chance to catch the Pokémon, each Pokémon has it's own catch rate % and the more moves you had left at the end of the level the more bonus catch percent chance you'll get. The Pokémon in the Mega Evo and Competition levels are excluded from this and cannot be caught. In cases of timed stages the amount of time you had left will contribute toward your catch percentage in the same way as moves remaining. Each time a level is succesfully completed the player is awarded one of four ranks; C, B, A or S, S being the best possible and C being the worst. 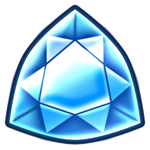 The ranks the player is awarded are based on how many moves the player had left when they cleared the stage. The best rank the player has attained on a stage will display on the overworld - this applies to standard and expert stages but not special stages. S Rank is the highest/best rank and can be obtained by completing a stage with 50% or more moves or time remaining. Puzzle main stages only have a single way you can win so will nearly always award an S Rank when beaten. 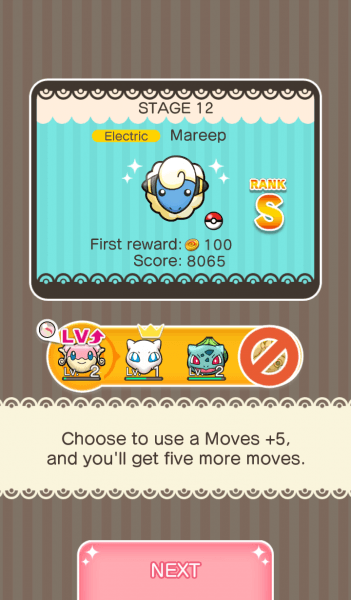 The "Moves+5 and "Time+5" powerups don't affect catch percentage but they do affect Rank awarded. Obtaining lots of S Ranks in Main Stages will help the player unlock more Special Stages. S Ranks obtained in the main stage path will unlock Expert Stages however S Ranks obtained in these Expert and Special stages don't unlock anything further. When you capture Pokémon you can take them along with you in the battles to come. Ideally you'll want to choose Pokémon with a type advantage against the Pokémon you are about to battle, you'll also want to put Pokémon for which you own a Mega Stone in the first or leftmost slot to enable them to Mega Evolve and used their enhanced abilities in battle. Most Main stages allow you to take four support Pokémon with you however there are stages that only allow three. If a player has less Pokémon than the number of support Pokémon allowed on a stage, or if the player chooses to take less than the maximum number allowed then stages will add their own support Pokémon. Some stages may add their own forced Support icons after the start. 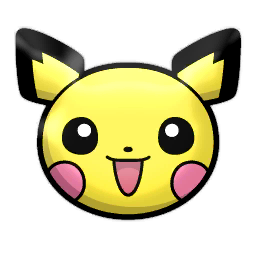 Default support Pokémon include either Pidgey, Happiny, Azurill or Pichu on most stages. First support slot will be filled with a Pokémon capable of Mega Evolution (ie. you have their Mega Stone. ), where you have multiple Pokémon capable of Mega Evolution the one with the strongest type advantage against the opposing Pokémon will be selected (Super Effective would take priority over Effective for example). Pokémon with the best base attack power and type advantage (and thus best damage) will fill the remaining slots. Where multiple Pokémon have the same attack power and effectiveness the slots will be randomly filled from those mons. Where the player has no Pokémon capable of Mega Evolution all slots will be filled based on damage (attack power, best type advantage). When the player defeats a Pokémon they've not yet caught they get a shot at catching it. Each Pokémon has it's own set base rate of how difficult it is to catch but the player can tilt the scales in their favour by doing really well on stages and earning a catch bonus based on the amount of moves they didn't use in the stage. In the case of timed battles its an increased bonus catch percentage chance based on every three seconds remaining on the timer when the stage was cleared. 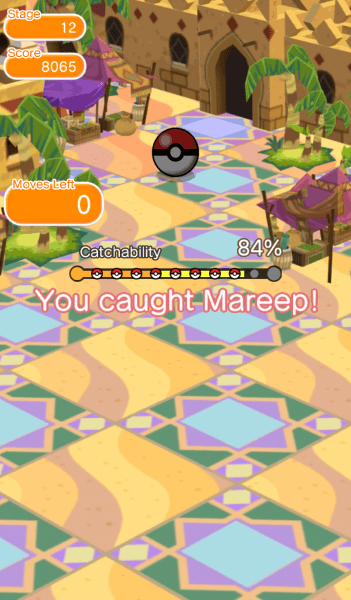 Trying to catch Mareep with an 84% catchability chance, catching Mareep and our end of level bonus. Time remaining that was based on Moves+5 or Time+10 will not count toward the bonus game, so if you used a Moves+5 and had 5 moves left these five moves won't count towards your catch bonus. The one time an item/powerup does help toward the catch bonus is if the player ran out of time and used a Jewel to get more, any time left over from the Jewel usage DOES count toward bonus catch percentage. If the attempt to catch the mon fails with a standard Pokéball the player can opt to buy a Great Ball which will double the catch rate. Great Ball's cost 2500 coins for 3DS users and 3500 coins for Mobile users. Should the attempt with the Great Ball fail more can be purchased however the catch rate won't improve any further after that initial double. There is a percentage chance for a Pokémon to flee after the first Great Ball is used; this varies depending on what mon it is. A Pokéball icon will display on the map screen next to any stage where you already caught the mon, remember - you gotta catch em' all. 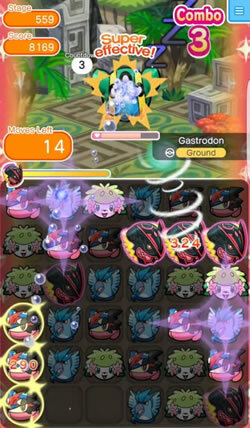 Whenever a player defeats a certain number of levels (usually every 10th level) they get the chance to take on a Mega Pokémon; as you'd expect these mons are tougher than your average, but the rewards are also greater, defeating a Mega Mon will yield you a Mega Stone of the defeated Pokémons type. 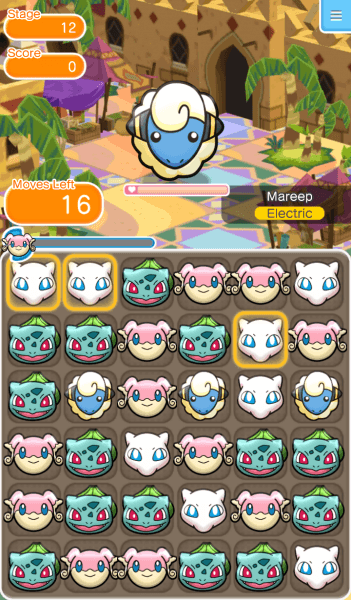 The primary Pokémon in the players lineup can utilise an appropriate megastone during a level to Mega Evolve; granting them the ability to clear out lots of squares and gain lots of points in quick succession compared to their normal versions. The primary aim of the disruptions placed by enemy Pokémon are to prevent you doing damage to them as quickly or even to try and stifle the player so much that they can't defeat the enemy Pokémon in their remaining number of terms or within the timelimit. Disruptions will be placed in random tiles or a selected area and can come in the form of simple blockages or enemy support Pokémon. Disruptions will be deployed by the enemy Pokémon throughout each stage. As you progress through the levels disruptions will become more frequent and more difficult to deal with. Each Pokémon you are fighting has a countdown box near the top left next to the score box, if this countdown box says 3 for example it means after the next 3 moves that the enemy Pokémon is planning to throw down a disruption. The enemy mon's countdown timer usually begins at 5 though there are a few stages where it starts at 0. Some disruptions are simply pre-set on the boards when they first load. Guess that wild mon must have anticipated being attacked by passing 3DS and Mobile users. Other disruptions can be triggered by Miscellaneous events such as the player getting a low combo score. If the player's Pokémon Mega Evolves during the stage, that turn won't count toward the countdown timer. Likewise if your move triggers a status effect it won't influence the disruption countdown (it was like this in 3DS and Mobile versions, but now only applies to Mobile.). Moves like Mind Zap and Astonish can also interact with the countdown counter/timer too. Abilities such as Barrier Bash and Rock Break can deal with certain types of disruptions. Mega Power's can remove all types of disruption. 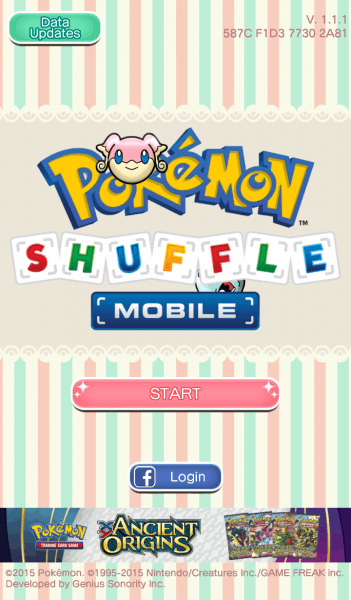 There are six different types of disruptions in Pokémon Shuffle, lets check them out. Block - A square metallic block that can't be erased by adjacent matches like a Rock can. Disappears 5 moves after appearing. Barrier - A square ice block that covers and freezes an icon in place, preventing it and any tiles above from falling, possibly creating empty tiles. Matching a frozen Pokémon icon will remove the Barrier, but the icon will remain for matching again. Black Cloud - A black cloud that covers and hides a Pokémon icon, but does not prevent it from being moved. Non-Support A Pokémon icon not on the player's Support Pokémon team, usually as the same type as the target Pokémon. If a stage adds a Non-Support Pokémon, and it is already on the player's team, the default Pokémon will be added instead. 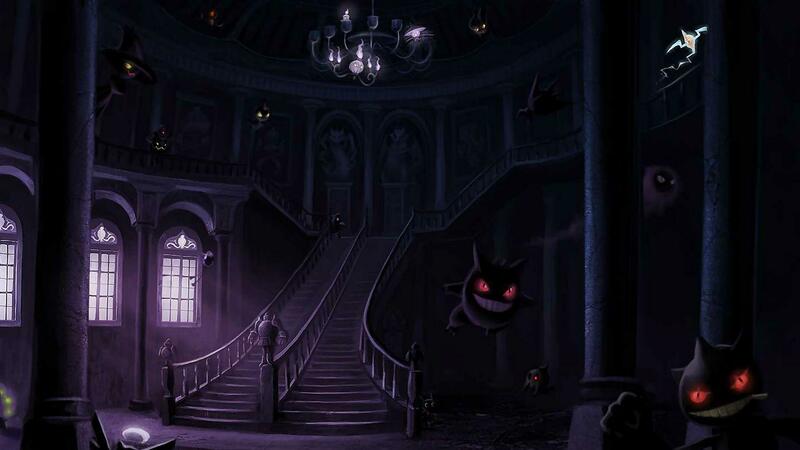 Like in the main series Pokémon games every Pokémon has a type, base attack power and some initially known abilities. All Pokémon begin with a base attack stat. As levels are completed Pokémon gain XP, this XP helps them level up, become stronger and in turn raises their base attack stat. Every Pokémon in Pokémon Shuffle has a single type so where Magnemite might be Electric/Steel type in the main games it would be just Electric in Shuffle. Nearly all Pokémon will use their base type from the main games. Any Pokémon who were Normal/Flying type however are all Flying type only in Shuffle. Dark, Dragon, Fighting, Ghost, Grass, Ice, Rock and Steel types are immune to falling asleep by use of a Sleep Charm. Dragon, Fire, Ghost, Ground, Poison, Rock and Water are immune to being burned. Electric, Fairy, Fighting, Fire, Ghost, Ice, Poison, Psychic and Steel are immune to being Frozen. Dragon, Electric, Fairy, Flying, Ghost, Poison, Psychic and Steel are immune to being Paralyzed. Ghost, Ground, Poison, Rock and Steel are immune to Poison. Bug, Dark, Dragon, Fighting, Grass, Ground, Ice, Poison, Rock and Steel are all immune to being Spooked by Spookify. Each Pokémon has it's own abilities that can assist you in certain situations by either doing more damage to your opponent or by clearing disruptions along the way. There are three types of currencies in Pokémon Shuffle; Coins, Hearts and Jewels. 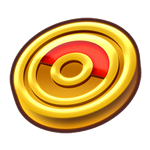 Coins - Players are rewarded coins for succesfully completing a stage, even if you don't manage to catch the Pokémon after. Generally the rewards are 100 Coins for Main stages, 300 for Expert and 200 for Special Stages (first time clears only). A reduced number of coins is awarded for completing stages for a second time on the 3DS version this is 30 Coins and on Mobile it is 20 Coins. In stages where coin disruptions occur there is scope to gain an additional bonus coin reward. Like hearts, coins are sometimes given as gifts. 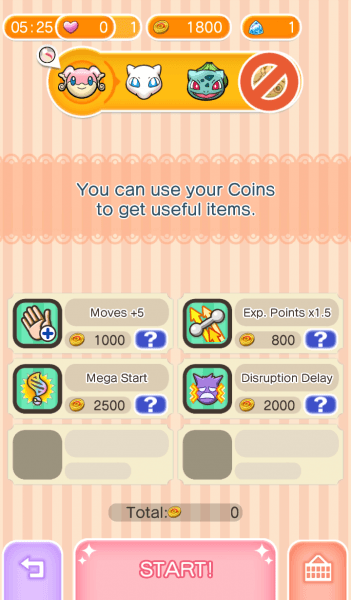 Coins can be used to purchase in-game items and to unlock some Special Stages. The maximum number of coins a player can have at any one time is 99,999. (First World Problems). Sometimes there are Special Stages like the very rich Meowth that award lots of coins compared to Main Stages. Hearts - Hearts are essentially credits used to play levels. In most cases when a level is played one heart will be used up, and as mentioned previously a heart will regenerate every half an hour. Additional hearts can b e obtained as gifts, via use of StreetPass (3DS) or Facebook actions (Mobile), in exchange for Jewels or even as rewards for completing certain stages. Non-Facebook mobile users can exchange codes with friends ingame to gain hearts too. Hearts will only regenerate if you are below the normal maximum number. On the 3DS standard hearts and regenerated ones are stored seperately and the maximum number of each a player can have at any one time is 99. Jewels - This is the game's premium currency. Most microtransactions using real currency are based on acquiring Jewels. These can be used to buy additional time to complete stages and can be exchanged for hearts or coins. Mobile players would exchange real world cash for Jewels in the Jewel Shop whereas 3DS players can empty their pockets for Jewels in the Nintendo eShop. There are fixed upper maximum spends per month for users under 18 years old. These limits are currently at: US$80, €100, £80, AU$150, NZ$150, or ¥10,000. In the mobile version even players above 18 years old are capped at 1500 USD or £1000 GBP maximum spend per month. The following items can be used to assist you in battle or to help you gain more from succesfully completing a battle. The maximum number of items of any single type that a player can hold is 99. Attack Power ↑ Attack power gets doubled for the duration of that stage. 5000 Coins 3000 Coins Can only be used in certain Special Stages. Complexity -1 One less type of Pokémon, or disruption will appear. 9500 Coins 9000 Coins Can't be used in 3 Pokémon Stages or Survival Mode. Disruption Delay Slows down the opposing Pokémon's ability to cause disruptions 2000 Coins 1500 Coins Can only be used where an opponent is capable of using disruptions at the start of a stage. Exp. Points ×1.5 XP Gain awarded at end of the stage is multiplied by 1.5x 800 Coins 300 Coins Cannot use in stages that don't grant XP. Moves +5 The player is granted an extra five moves to complete the stage in 1000 Coins 800 Coins Can't be used in Competitive Stages. Time +10 Ten seconds are added to the countdown timer in timed stages. 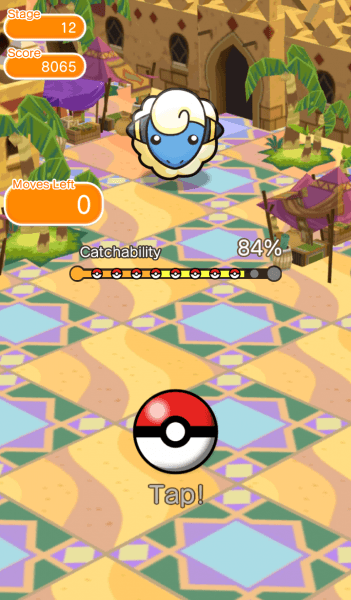 1000 Coins 800 Coins Doesn't affect catchability bonus. 3DS users can check in once a day, essentially check in is just loading the game with the internet connected them in order to recieve a reward. Day's dont work based on everyones local time though it goes on every 24 hours server time, so check in's reset daily at 6:00 AM UTC). Checking in synchronises your copy of Pokémon Shuffle with the host server versions thus changing/updating what Special Stages are available to you to be in line with the server. So that's what Check in means to 3DS users. For Mobile users there is no 'Check in' as such but Pokémon Shuffle Mobile will run it's own update checker when the game is loaded, if updates are available they will be applied automatically. The mobile version cannot be loaded without access to an internet connection or suitable mobile network. Pokémon Shuffle is actually known as PokéToru (combination of Pocket Monsters and the word toru (とる, possibly means "to capture")) in Japan. 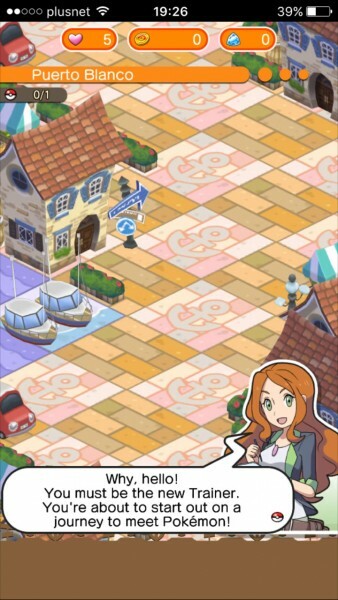 For the mobile version, Pokémon Shuffle Mobile is called PokéToru Smartphone Version in Japan. 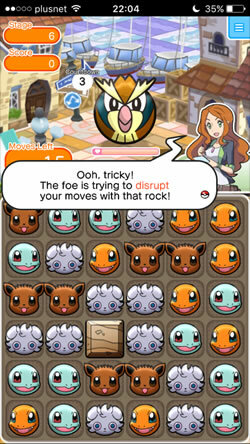 To me Pokémon Shuffle is a quick and fun game you can play a few rounds of if you're a generally busy person, yes it has premium features and micro transactions but I've personally never paid a penny playing it and I really enjoy it - but alas, I am just one guy and here's what other reviewers and major sites had to say about Pokémon Shuffle. Christian Donland of Eurogamer whilst not providing an actual numeric score gave a rather scatching review of Shuffle and referred to it as "A dull puzzler, undermined by the grasping philosophy behind its business model as much as the actual amount of money it could cost you." Nintendo Life's Morgan Sleeper was a bit more forgiving; scoring Shuffle a respectible 7 out of 10 in his review. "Pokémon Shuffle is a fantastic match-three puzzle game marred by an uncharacteristically sleazy suite of microtransactions"
Over 16 Critic reviews on Metacritic Pokémon Shuffle scores a Metascore of 56/100. 127 Metacritic users have also weighed in with their own ratings and the average score comes out at rather mixed 60/100. Whilst the review scores are not particularly impressive for this title I would say that the main source of criticism is the Premium/paid for features, and I feel a bit like Shuffle has been compared to the playability of non premium games rather than comparing it against other Freemium titles; against which it stands up pretty well to me.